Rene and Lani graduated from Covenant Seminary in May 2000, he with his M.Div. degree, and she with a Master of Arts in Theological Studies. 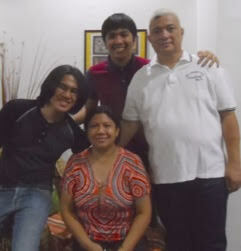 Their family now lives in Cagayan de Oro, on the island of Mindanao, in the southern Philippines. "The Portal Study Center" is a ministry to high school and college students and professionals and is also the base for a growing number of ongoing Bible Studies and short seminars on Christian living. In August 2001, Rene and Lani established the "House of Hope Ministry Center", a ministry to the Bajau tribe, a very poor Muslim group that is shunned by almost everyone. The Quimbos oversee programs for the Bajau people such as literacy classes, a daycare center, regular education, a clinic, and cell group meetings. There are also a number of livelihood projects, helping Bajau men and women to earn a living rather than begging in the streets. Similar programs are offered to a mountain people called the Higaonon tribe at the "Hillside Learning Center", established in 2004.